No entries in the timeline here should need a password to access them individually. If so, please report, for example through my twitter account. Thanks! And a side note about copyright infringement: This is a private and non-commercial weblog. I seldom do present my books here, but that's it; no advertisements which I get money from, no webshop. I will not deliberately link to sites with copyright infringements. Since the OLG Hamburg and the EuGH ballpoint pen pushers act in their parallel universe, I will do my best to check the contents of websites to which I am linking to, for copyright infringements. Yet this is quite futile since link target contents change often, and even the OLG itself is said not to have guaranteed in writing that all their own links would not at all point to sources with possible aforesaid infringements. Which is no wonder since near-100% safe checking would be a fulltime job which I think no sane living being can possibly fulfill. 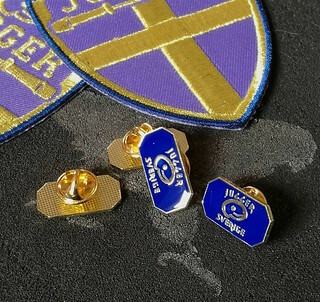 Two works for the Swedish Jugger association and Projet: Jugger i Sverige: Gold wire embroidered patches and metal pins. 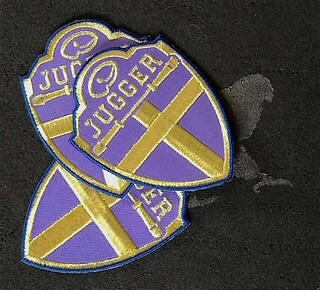 Furthermore, I have done a Backdrop for the Jugger project. Special thanks to Ami Desgin! Naturally, my small sons have been quite interested in what is going on. Yet playing with painted miniatures and delicate terrain would be a bit ... read more ⇒ Continue reading "Forstgrave for Lego"
It turned out that this wasn't as easy and straightforward as I thought. In fact it was hard to find such a spreadsheet; just some formulars spread over the web. So, I made one myself some years ago. The sheet is made with OpenOffice for Mac and converted for Excel. You might include a simple multiplication of the total time with your hourly wage. You are welcome to suggest enhancements or report errors, of course. Side note: Use at your own risk, of course. No guarantees whatsoever. Functionality of the Excel sheet cannot be guaranteed. Happy 2018! I prepared a little video about Fuel Rat ship builds in the Space sim Elite: Dangerous. Welcome to watch it on YouTube.